Exceeding Your Expectations! 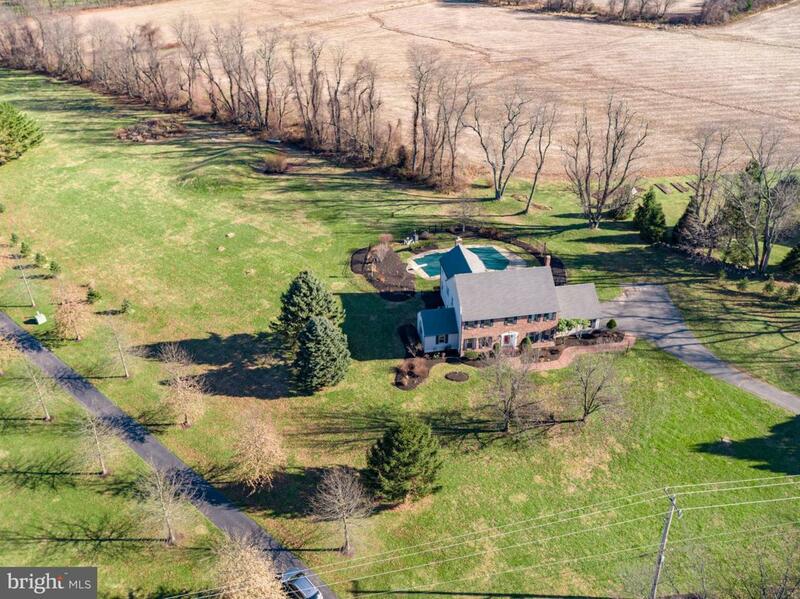 Marvelous 3 acre house in the heart of prestigious Bucks County ~home to rolling hills, beautiful farmland with stunning bucolic views, fascinating history and unique shopping. The brick paver walkway and custom landscaping offer charming curb appeal which is further enhanced by the covered front entrance-way. 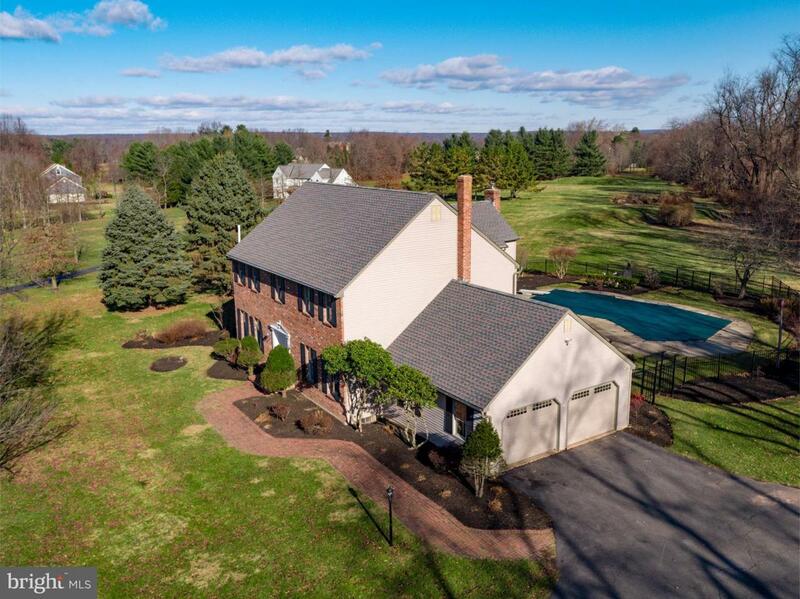 This exceptional 4 bedroom, 3 bath brick colonial offers an abundance of luxurious amenities including rich hardwood floors through-out except baths and kitchen. Welcoming two story foyer with crown molding and dual coat closets. Elegant living room offers recessed lighting, crown molding and wainscoting. Gracious formal dining room with recessed lighting, crown molding and wainscoting offers apace for more formal entertaining. New gourmet kitchen with breakfast area and white cabinetry boasts recessed lighting, attractive pendent lighting, granite counters, island/breakfast bar, stainless appliances, deep under-mount sink, walk-in pantry and ceramic tile floor. Inviting family room is ideal for relaxing with recessed lighting, crown molding, bay window and cozy wood-burning fireplace with exit to deck. Convenient first floor office with vaulted ceiling. First floor laundry with laundry sink, double closet with ceramic tile floor. First floor full bath. Oak hardwood stairs to second floor with recessed lighting, crown molding and two hall closets. Hardwood floors throughout second floor. 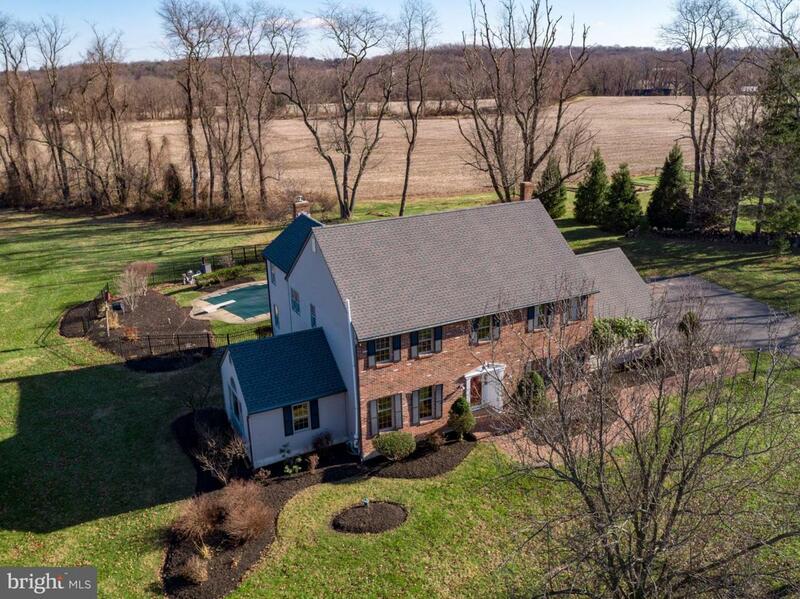 Master bedroom retreat offers bay window and walk-in closet with built-ins. Master bath with new light fixtures, dual vanities, shower jetted tub and ceramic tile floor. The three additional bedrooms have closets with custom built-ins. Hall bath with dual vanities, tub/shower with ceramic tile floor. The lower level offers a partially finished area with recessed lighting and carpeting~an additional 500 sq ft of living space. There is an unfinished area for good storage. The deck has built-in seating and over looks the lovely in-ground pool. Newer roof, pool cover and 2 garage doors. 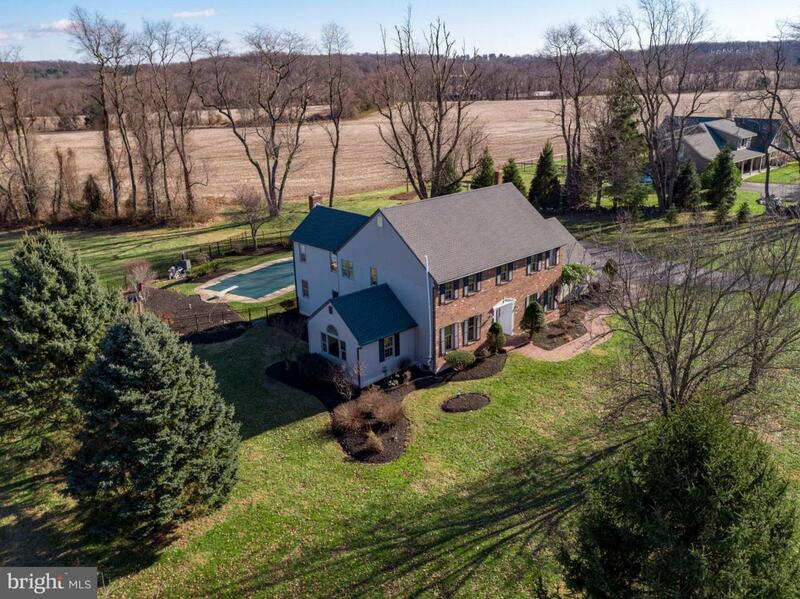 This property is convenient to NJ, New Hope, Doylestown plus the historic Solebury Villages of Carversville and Lumberville. Also near-by is the Delaware River area with its many special restaurants, shopping and entertainment. A one year AHS Home Warranty for peace of mind! What a perfect place to call home! !